A double gable, a pair of dormers, and a wrap-around porch give this three bedroom home instant curb appeal. 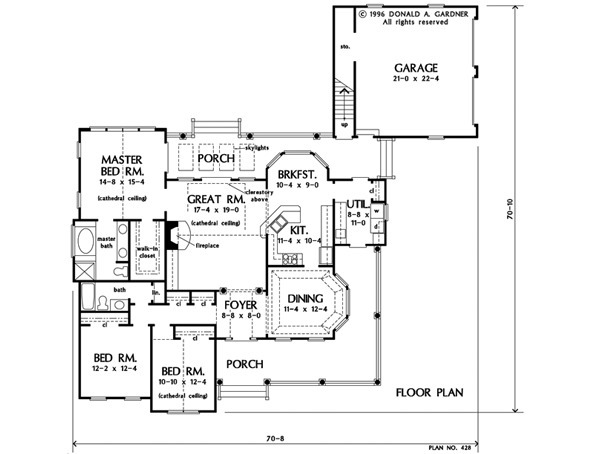 Inside, vaulted ceilings add volume and light, while dual columns separate the foyer and great room. The great room features a cathedral ceiling and built-in cabinets next to the fireplace. Busy home owners will appreciate the spacious utility room. Another cathedral ceiling adds volume and drama to the master suite which includes a roomy walk-in closet. Two family bedrooms share a hall bath with linen closet. Skylights brighten the covered rear porch as well as the bonus room over the garage. 1st Floor: 1838 Sq. Ft. 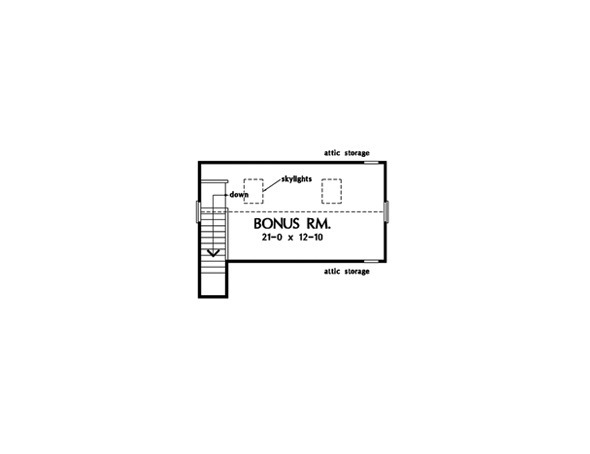 Bonus Room: 362 Sq. 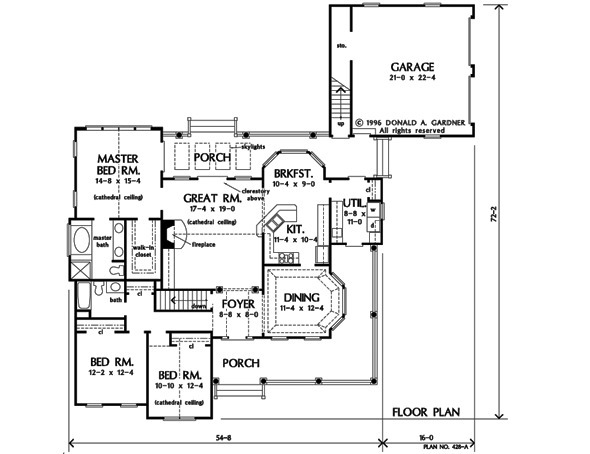 Ft.
House Dimensions: 70' 8" x 70' 10"
Great Room: 17' 4" x 19' 0"
Master Bedroom: 14' 8" x 15' 4"
Bedroom #2 (Cathedral): 10' 10" x 12' 4" x 13' 6"
Bedroom #3 : 12' 2" x 12' 4" x 8' 0"
Bonus Room (Cathedral): 21' 0" x 12' 10" x 11' 0"
Breakfast Room : 10' 4" x 9' 0" x 8' 0"
Dining Room (Tray): 11' 4" x 12' 4" x 9' 5"
Foyer (Vaulted): 8' 8" x 8' 0" x 17' 0"
Garage : 21' 0" x 22' 4" x 0' 0"
Garage Storage : 3' 4" x 16' 0" x 0' 0"
Great Room (Cathedral): 17' 4" x 19' 0" x 17' 6"
Kitchen : 11' 4" x 10' 4" x 8' 0"
Master Bedroom (Cathedral): 14' 8" x 15' 4" x 15' 4"
Porch - Rear : 29' 0" x 8' 0" x 0' 0"
Porch - Front : 29' 8" x 8' 0" x 0' 0"
Porch - Left : 0' 0" x 0' 0" x 0' 0"
Porch - Right : 8' 0" x 24' 4" x 0' 0"
Utility Room : 8' 8" x 11' 0" x 8' 0"